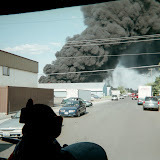 NARRATIVE: At just after 4 pm on April 17, 2008 the Spokane Fire Department was dispatched to a detached single car garage that was reported to have had a couple of young males running from the area just before the fire was noticed. The garage fire occurred at 2727 E. Sanson. Fire investigators were called to investigate the fire and interviewed some of the witnesses at the scene. If you have any further information relating to this fire please call the Spokane Fire Department at 625-7000.